AppleTell claims that Apple may be targeting a launch of the Mac App Store as early as December 13th. An inside source has just told us that Apple is targeting a Monday, December 13th launch of the Mac App Store. The company apparently told developers to have their software prepared for a launch as early as Monday the 6th of this month, but our contact would be shocked if that happened at this point. Apple has made no official announcements regarding this, and delays could always happen, but there's a push to be launched before Christmas, well ahead of the previously estimated January release. According to their source, Steve Jobs has been pushing for an early release and Apple is reportedly ahead of schedule for the release. While we can't verify these claims, we do know that Apple started asking developers to submit their apps to the Mac App Store back on November 3rd. Apple has also recently seeded a new version of Mac OS X 10.6.6 to Mac App developers. Mac OS X 10.6.6 will be required for end users to use the Mac App store and needs to be ready for the launch. Such an early launch would be well ahead of schedule. 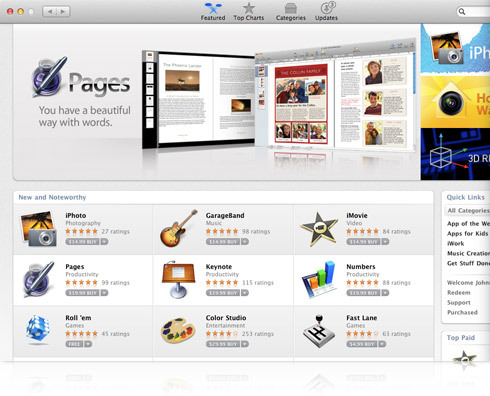 Apple had announced on October 20th that the Mac App Store would open in "90 days", which gave it a target date of late January 2011.